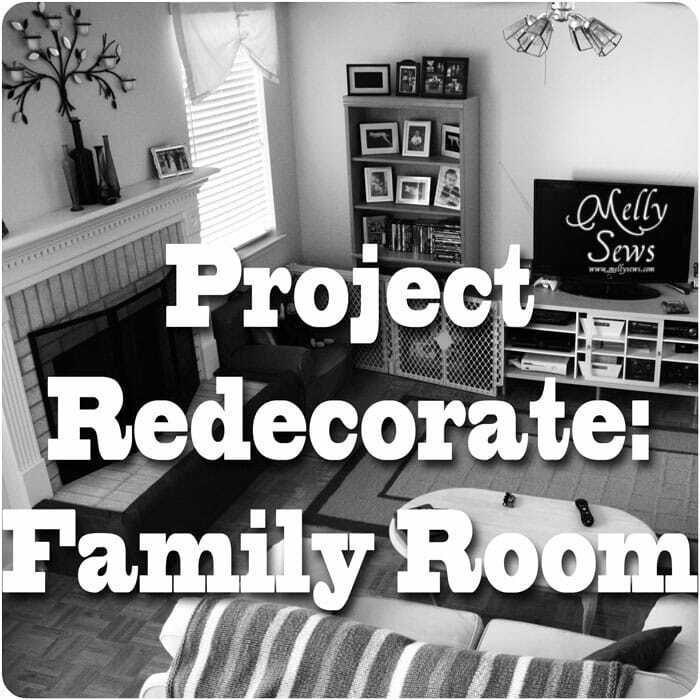 Welcome to the next post in my Project: Redecorate series. 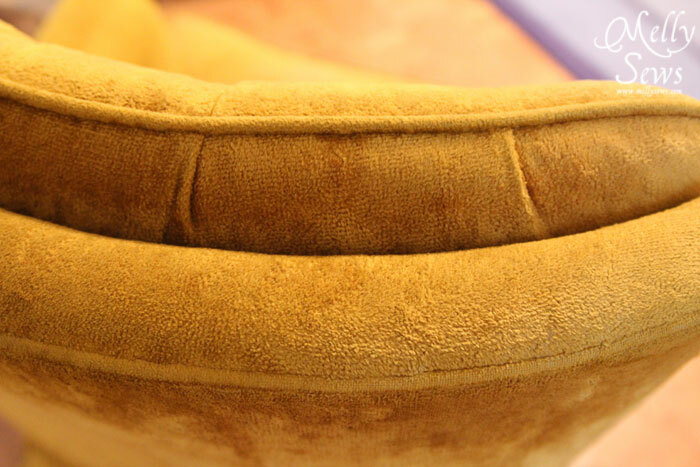 Today we’re going to take a look at how to reupholster a recliner. 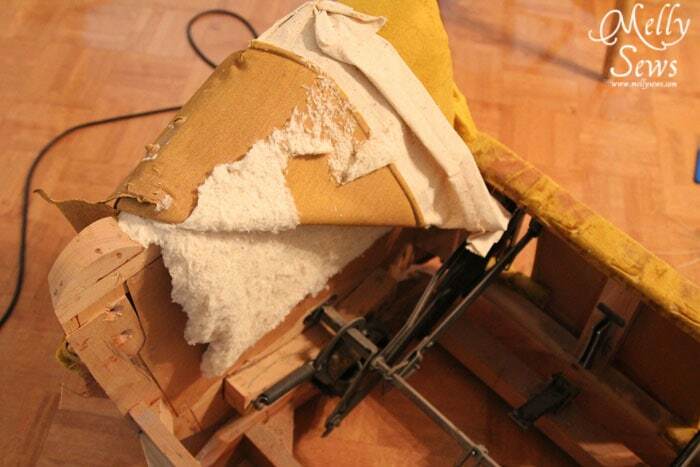 So, this is NOT a step by step on how to reupholster a recliner. I had that in mind when we started, and then I realized about 5 pictures in that it is a much more detailed process than the space of one tutorial post would allow. But I will point you at the tutorials and videos I used for help. And funny thing about this recliner – this chair is what started the whole rearranging and redecorating. See, Hubby asked for a recliner after Christmas. He claimed that he wanted one forever and I would never let him get one, etc, etc, sob, whine, beg (wonder where his kids get it from?). 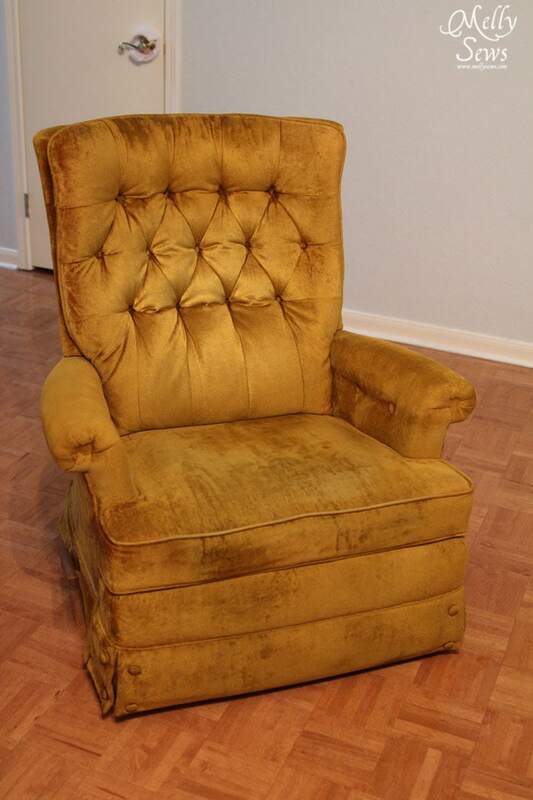 Because Hubby is not a negotiator and he went without me to look at and buy this chair, he paid the full asking price of $60 for this Lazy Boy recliner from 1972 – we know the year because we found a tag with the manufacturing date. He failed to notice that it had a semi-attached back. Why is this important? 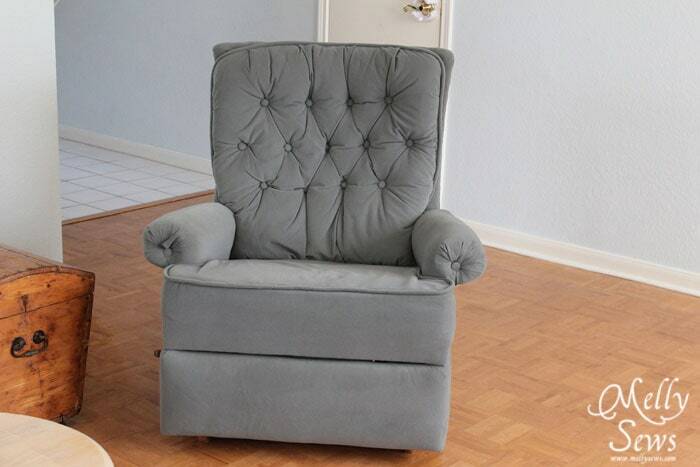 Because a semi-attached back tufted recliner is probably the hardest reupholstering project one could undertake. Take more pictures than you think you will ever need. We took a lot and there were still a few things we couldn’t remember how to put back together without a lot of discussion. If you have access to or can rent a pneumatic staple gun, by all means do it. We borrowed my parents’ gun and it made a HUGE difference over previous projects we had done with a regular and electric staplers. I HIGHLY recommend writing on the pieces you take off so you can figure out where they went if you are using them as fabric patterns. By this point I was convinced that the chair had once resided in a household of cats as I had that special tickle in my throat (I’m allergic to cats). We couldn’t get done fast enough. I bought 50% off clearance upholstery fabric and supplies for $80, so all told this chair cost $140 – well under the $200 budget I gave Hubby. Adding that to the $63 I spent on the other chair and table this brings my redecorate price tag to $203 so far. Since Sew in Tune starts next week, I’m going to put this series on hiatus, but it will be back in March. 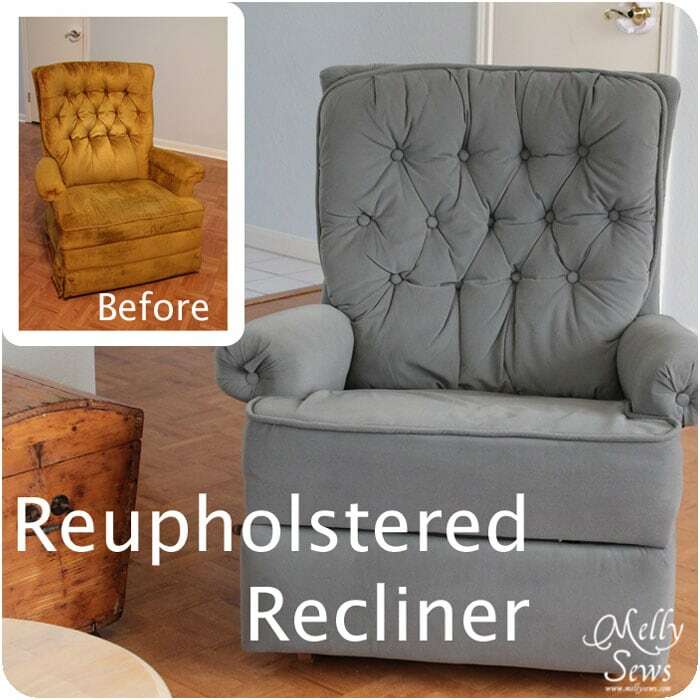 Tell me what you think – would you ever attempt to reupholster something? Also, I need pillow ideas – the denim pillows we have in the living room now aren’t cutting it for me anymore. What should I replace them with? Feel free to link to cool pillow tutorials in your comments – I need ideas! This is seriously impressive. It looks so great! The semi attached back is the worst to try to do. Thanks for the helper links! I made one recently and they look so pretty! One thing to be aware of though, where it says in the tutorial that you stitch the ends of the strip together to make one strip that’s at least 9 feet, I think it’s supposed to be 9 yards, because when I made mine I needed a 27 foot long strip! And I don’t have a ruffler attachment for my sewing machine, so I had to gather them by hand. It was worth it though, it looks fabulous. Wow you are brave!It turned out amazing! 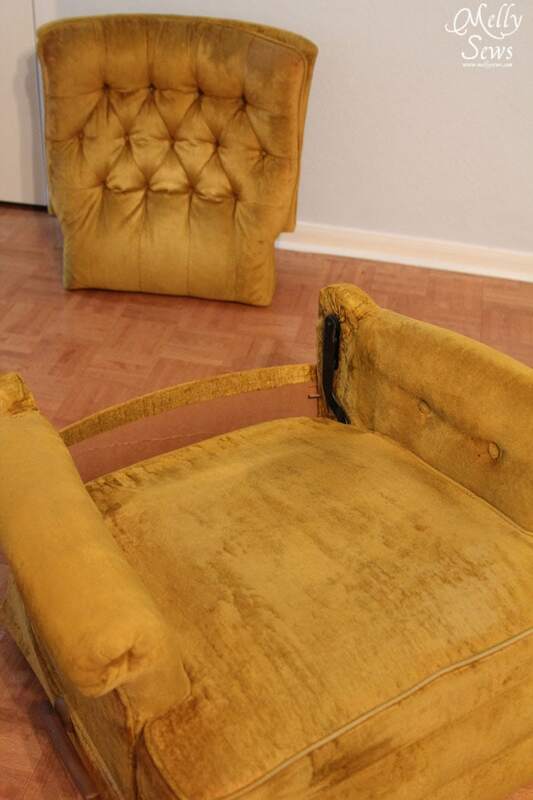 I’ve always wanted to try re-upholstery, thanks for posting those links, for reference. Yours turned out so nicely! Wow! This is really amazing, Melissa! I so love reupholstering furniture, it is such a fantastic feeling! Your chair came out fantastic!!! 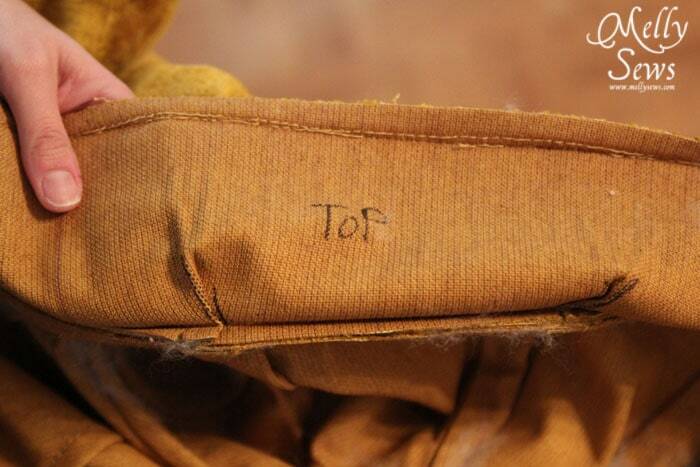 Hmmmm, would I every attempt to reupholster something……As a matter of fact I would– I have! We bought a beautiful couch some years ago, and because we only had 2 real bedrooms, when my father came to stay with us after having open heart surgery, our poor son had to sleep on the couch for um, let me see, like 4 months. 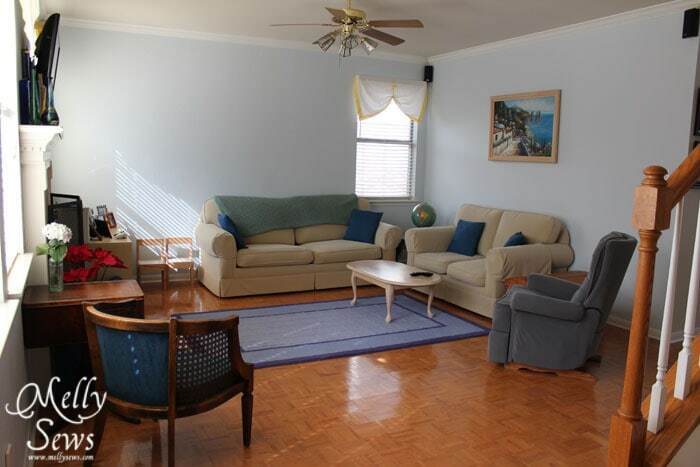 Usually I always had the couch cleaned twice a year, because it was brocade, and a light color. But I didn’t want to have it cleaned and him sleeping on it because I was concerned that he might get sick from the solvents–maybe. But then after everyone in the house continued sitting on it, and company as well, when I finally called the company out to clean it, it didn’t look like it should have, so I ordered a video on how to reupholster my big over-sized rolled arm couch. 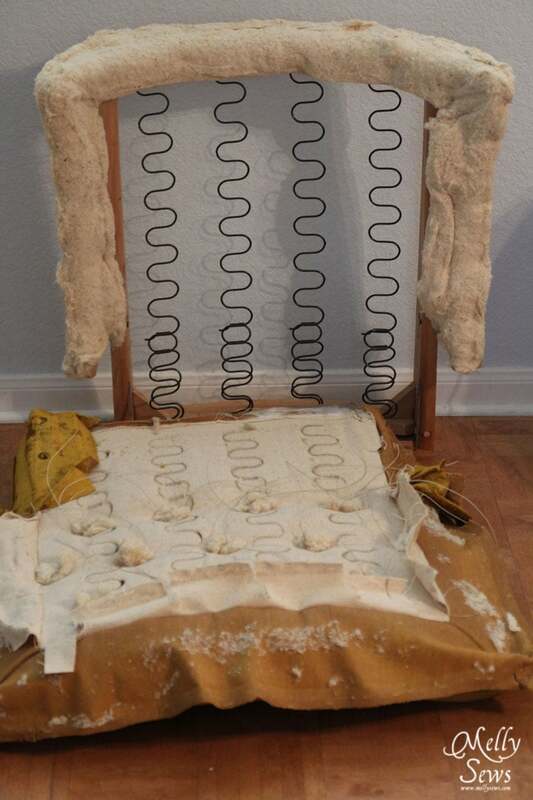 It was easier than I thought, although I use the term reupholster loosely, because actually my couch had an attached slip cover, and I slip covered it. I used a cinnamon colored embroidered satiny-like fabric, and I changed the throw pillows and made some envelope style, and two I made using suede on one side and the same fabric of the couch on the other. I bought boullion fringe for the bottom of the slipcover and it turned out very nicely. I even attempted to put a kinda thick cording around the upper back of the cover and the rounds of the rolled arms. Then I made an accent pillow for the Chair that we had in the living room, we loved it, now just yesterday, I was talking about slipcovering a chair in our bedroom. So I have to say Thank You for the inspiration! Once again, you’ve done a marvelous job. You’re so talented and courageous! I recently redid a chair just like the one you did. I ended up changing the style to avoid doing the semi attached back it turned out really well I left the original fabric and stapled the attached back down to make it appear seamless. It actually turned out rather well. I purchased fabric from amazon.com it was 1/3 the price of the same farbic in the store. I have the exact same gold velvet vintage Lazy Boy to recover. Holw many yards of upholstery fabric were required? 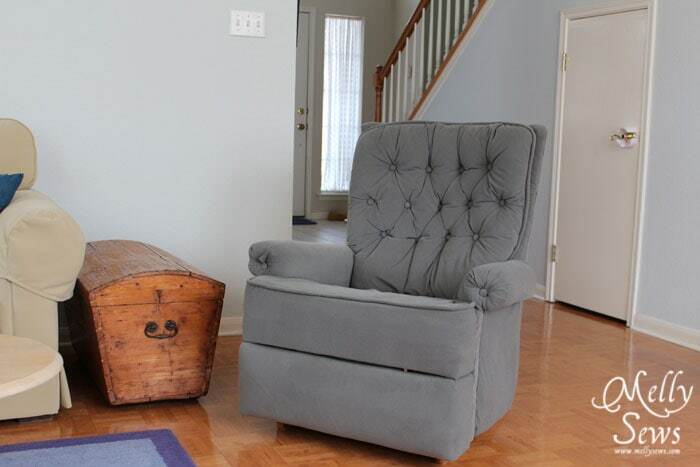 Love this!We have a soiled ugly recliner my husband loves. The next school holidays I will try to recover. Got the fabric for $2 per yard! I am about to undertake the “recovering” of a similar chair. My teenage sons broke the reclining mechanisms so I am going to just fix it permanently in place. I should write a book about “how to fix or repair things your kids destroy”. This chair is special to me because it was my moms, and she has passed now. It rocks, which I love. Now, I have 5 yds of a grey – aqua duck. I did an antique “grandpa’s porch chair” last month with excellent results. But this doesn’t look easy at all. I’m scared to death of the buttons. Just going one step at a time. I have seeing friends and a sewing sister nearby for advice. Thank you for sharing or I wouldn’t feel brave enough to try!